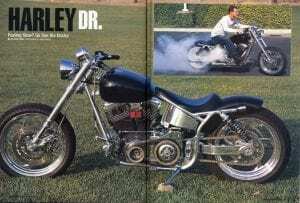 Located in Costa Mesa, California, is a shop called The Harley Doctor, and the owner, Geoffrey Gaites, has been healing sick bikes since 1996. 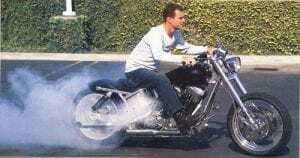 He has a PHD in Harley Davidson tech from M.M.I. and has been a practicing bike doctor since 1989. His mission was to be able to achieve maximum tuning of the engine with a dyno to get seat-of-the-pants horsepower. 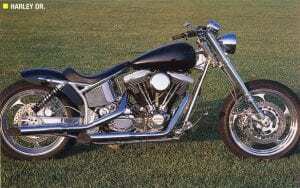 But after years of fixing and hot rodding other people’s bikes, he needed a break and decided to build his dream bike. Geoffrey planned his bike with two things in mind: it had to be as light as possible, and it had to be the fastest bike around based on an 80ci Evo motor. Now that Geoffrey had a roller, the motor was the next step. He had a blueprint for power in mind, and his starting point was 80ci. 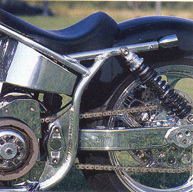 The S&S cases hold H-D flywheels and Eagle I-beam rods topped with JE pistons. 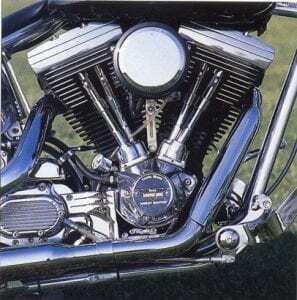 The cylinders are Axtell and the heads are Johnson Engine Technology, with some special attention given to the ports and valves. To bring it all home, a Woods cam was installed with adjustable pushrods, and a modified S&S G carb was bored to 48mm. Then, exhaust pipes by Cycle Shack were bolted on. 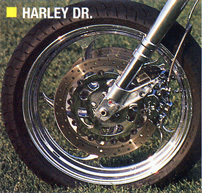 To transfer power to the rear wheel, Geoffrey used an H-D five speed trans case, with Andrews’ gears, and a BDL primary drive and clutch set. Geoffrey was itching to get this bike started, so the first thing he did was chase down a frame. He went to Wildcat Engineering to have a rubber-mounted aluminum frame made, with 31 degrees of rake, no added stretch, and a weight of only 28 pounds when finished. The frame was then polished to match the JMC swingarm Geoffrey had already bought. For suspension, a set of A&A Racing triple-trees hold Roma legs from KTM that have external compression and rebound adjusters for the best handling at high speeds up front. He then put a set of Works Performance shocks out back, and to get it rolling, a pair of P.M. wheels – a 19-inch front and an 18×5.5-inch out back. Both are covered in Dunlop rubber, with floating rotors and calipers by Brembo. The Doc was still making house calls for sick bikes while working hard on his own bike. 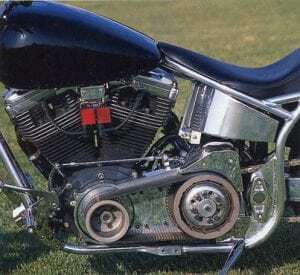 Geoffrey feels that all Harley-Davidson’s should be black, so the sheetmetal and paint were easy and simple. 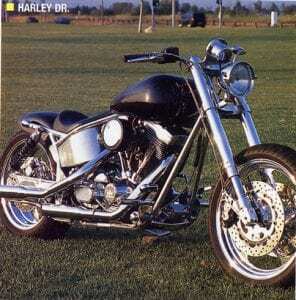 He had an H-D FXDX tank and a WCC rear fender sent over to Danny Martinez, who molded in a flush gas cap and cut the rear fender down to just clear the center of the wheel. He then sprayed on House of Kolors Jet Black, buffed it out, and shipped it. 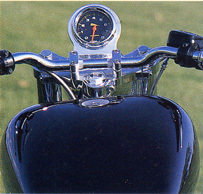 When it arrived, Geoffrey mounted Krome Works bars with P.M. grips to a set of A&A risers and added hand controls by H-D, foot controls by Kuryakyn, and a headlight and taillights from Weekend Concepts. He had a seat made by Bitchin’ Rich and wired up the bike. This bike took a little longer to build than Geoffrey had planned on, but everything else was just what the Doctor ordered – a light bike that looks like a stock 80ci Evo but puts out heavy power, like 113.7 hp at the rear wheel and a top speed of 158 mph. He calls it a fun bike to just ride around on, but if he feels up for some seat-of-the-pants speed, it is there with a twist of the wrist.